The stunning Clogau Pendant Necklace features a beautiful Mother Of Pearl, encased in a warming rare Welsh 9ct Rose Gold pendant. Suspended on a delicate 22" 9ct Yellow Gold Curb Chain Necklace. Exuding luxurious elegance, the Clogau Necklace is a fantastic addition to any fine jewellery collection. This fabulous designer Clogau Pearl Necklace embraces the demands of modern jewellery and combines this with elegant style. The Clogau Designer Pearl Pendant offers a timeless keepsake, making this a great gift choice - Designed to represent purity and innocence. The Clogau 9ct Gold Pearl Necklace adds a touch of sophistication to any outfit, inspired by Welsh themes and romantic stories. The delicate design of the Clogau Mother of Pearl Necklace can easily be teamed up with other pieces from the Clogau Tree of Life Range - Perfect to match your own unique style, suitable for all occasions. All Clogau products come with a 2 year warranty. Over 150 years ago, rare Welsh gold was discovered in the Clogau St. David’s gold mine, within the mountains of Snowdonia. These precious veins of gold became increasingly difficult to locate over time and mining ceased over a century later. In 1989 William Roberts, Clogau's Chairman, discovered the abandoned mine and gambled on the idea that there would be undiscovered gold still buried within. To make best-use of this precious Welsh gold, William used it exclusively to create jewellery of the very highest quality, beauty and originality celebrating the magnificent landscapes, myths and legends, and extraordinary flora and fauna of Wales. Every piece of Clogau jewellery contains this very same rare Welsh gold, designed to be worn and treasured for a lifetime – the Gold of Royalty for over 100 years. All Clogau pieces are packaged in authentic Clogau packaging. Need advice on how to best take care for your jewellery? 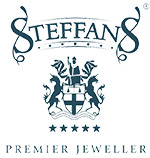 Call us for more information on 01604 622090 or e-mail online@steffans.co.uk and we will be more than happy to answer any questions you have about this item.